Automakers and parts suppliers got back on the recovery track in the second quarter but retailers remained in the doldrums. This came in the wake of poor first-quarter performances by all three stock groups followed by the Automotive News Europe/PricewaterhouseCoopers Transaction Services Shareholder Value Index. With five out of seven automakers recording double-digit gains, the sector achieved overall growth of 13.9 percent in the second quarter of 2012. Partsmakers achieved exactly the same growth of 13.9 percent in Q2. Retailers, however, saw a further fall in value, even though the 0.5 percent rate of decline in Q2 was an improvement on the first quarter's 3.4 percent drop. Within this group, however, some companies still managed good gains. The strong performances in two of the three automotive categories was in marked contrast to that of leading stock exchanges. A 4.8 percent rise in the German DAX 30 and a 2.9 percent rise in the French CAC 40 were the best performances stock markets could manage in the quarter. "The auto industry has overcome a number of the factors which affected consumer sentiment in a negative way the first three months of this year," commented Jason Wakelam, leader of PwC UK's Automotive Transaction Services. "However, retailers as a whole continue to lag well behind, as they have done for the last three years." Manufacturers tracked by the Automotive News Europe/ PricewaterhouseCoopers Transaction Services Shareholder Value Index showed a strong performance across the board in the second quarter. Fiat once again demonstrated underlying strength, turning a decline in shareholder value of 4.6 percent in Q1 into a group-topping 20.2 percent gain in Q2. The Italian automaker took pole position in the index in Q3 last year with a 32.9 percent gain in value and was second place in Q4 with a 36.3 percent increase. Fiat CEO Sergio Marchionne has plowed ahead with reforms in Italy, where he says the carmaker is unprofitable, by winning concessions from workers to raise productivity and announcing plans to close one plant in the country at year's end. Two German manufacturers, BMW and Porsche, both increased shareholder value in the second quarter by 19.6 percent, closely followed by Q1's best performer, VW, which gained 19.2 percent in Q2. Volkswagen sold more than 4 million vehicles during the first half of the year, a record for Europe's largest automaker. 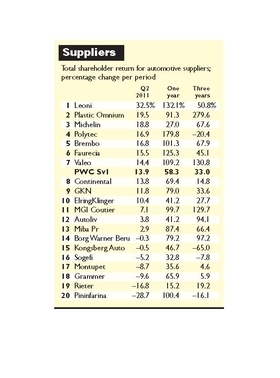 PSA/Peugeot-Citroen SA came next with a 15.1 percent gain, followed by Daimler at 7.2 percent. For the second quarter in a row, Renault finished at the bottom of the list, although its modest 5.6 percent growth still represents a 16 percentage point turnaround on its decline in Q1. Market sentiment for French automakers, and Renault in particular, has been affected by overt pressure on them from the French government to protect jobs ahead of next year's presidential election. The government is the largest shareholder in Renault, with a 15 percent holding. Both Renault and PSA are also widely regarded as having a greater dependence on sales of smaller, cheaper models than direct competitors, such as VW, while still facing the same hourly wage costs in their domestic plants. "The improvement in shareholder value, driven by demand in emerging Asian markets, is encouraging, although the European market is expected to remain tough. Falling sales in France and Spain in May, and concern over the wider global recovery, will have an impact," said Jason Wakelam, leader of PwC UK's Automotive Transaction Services. 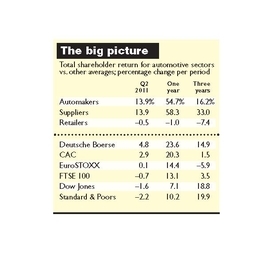 The suppliers group is the only category in the Automotive News Europe/PricewaterhouseCoopers Transaction Services Shareholder Value Index that has managed to record positive growth in every quarter since the beginning of 2010. This time the gain was 13.9 percent, exactly the same as that recorded by their clients, the automakers. Within the list of 20 European partsmakers, however, once again there was significant volatility. The most obvious was the fall from favor of Pininfarina S.p.A. The Italian design and engineering specialist had headed the list in Q1, its 56.6 percent growth driven by bid rumors. When these came to nothing it suffered a 28.7 percent decline in value in Q2, finishing at the bottom of the list by some distance. In its report on the first quarter, Pininfarina revealed further deterioration in its financial position. As well as continuing operating losses the company is bearing the brunt of a big arbitration award made against it in a dispute with Mitsubishi Motors Corp. ad is in ongoing debt rescheduling talks with its bankers. However, French businessman Vincent Bollore is now proposing to invest 30 million euros to buy a 25 percent stake in the Turin-based group. The latest quarter’s table-topping performance came from German-based wiring specialist, Leoni AG, which recovered from a 7.1 percent decline in Q1 with an impressive 32.5 percent gain. Leoni revised its profit forecast upwards after a good Q1 and has agreed to a 10 percent capital increase. This was followed by strong gains by French front-end maker Plastic Omnium and tire manufacturer Michelin, both companies had been mid table in the first quarter. For Plastic Omnium this represented a return to form – it had topped the list in Q1 last year and was second with 78.6 percent growth in Q4. Although the same number of companies recorded value falls in Q2 as in the preceding three months, for most the declines were smaller. Furthermore, it should be noted that only one company, Norwegian driver controls and cable specialist Kongsberg Auto, recorded declines in both quarters this year. Ignition maker Borg Warner Beru, German seating firm Grammer and Swiss acoustics and thermal products supplier Rieter, which had each shown very modest growth in Q1, lost shareholder value in the second quarter, with Rieter losing 16.8 percent. 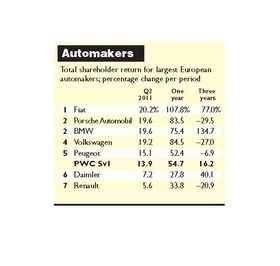 "The robust performance of partsmakers reflects the gains made by the automakers. It appears the fall out from the Japanese earthquake did not hit European partsmakers as badly as might have been expected," said Jason Wakelam, leader of PwC UK's Automotive Transaction Services. 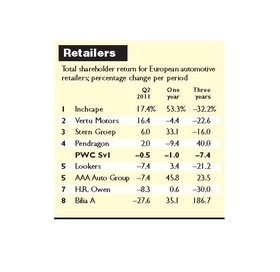 On the back of a strong first quarter performance, global retailer and distributor Inchcape achieved the biggest second-quarter growth in the retail category of the Automotive News Europe/PricewaterhouseCoopers Transaction Services Shareholder Value Index. Inchcape’s 17.4 percent rise in shareholder value contrasted with the 5.3 percent fall in Q1. First-quarter financial results, at the upper end of market expectations, reflected a strong performance in the UK and improvements in aftersales revenues in Europe. These partially offset declines in new-car sales there. Significantly, Inchcape enjoyed better than expected growth of 21 percent in Russia, eastern Europe and Southeast Asia. Vertu Motors, which also lost 5 percent in Q1, staged a similar Q2 recovery to Inchcape, rising 16.4 percent in Q2. The UK’s ninth-largest car retailer, which is based in Birmingham, has been pursing an aggressive growth strategy, increasing its number of outlets from 59 in March 2010 to 77 currently. Elsewhere, however, performances were much weaker, with four of the eight retailers in the group recording declines. Last May the Netherlands' largest car dealer, Stern Groep NV, reported a 44 percent increase in first-quarter net income compared to same quarter a year earlier. Stern’s growth plans, however, are already appreciated by the market and its shareholder value grew by just 6.0 percent in Q2, following 7.2 percent in Q1. Following two consecutive quarters of 20 percent plus growth, however, AAA Auto Group NV faltered, with a 7.4 percent decline in value in Q2. The company operates new and used vehicle sales subsidiaries in nine central and eastern European countries. The biggest reversal in the quarter was seen by the Swedish dealer group Bilia AB. Like AAA Auto, it had enjoyed two strong quarters in a row, including a rise of 22.1 percent in Q1 this year, before relinquishing 27.6 percent in the latest quarter. It is also noteworthy that, despite setbacks in Q2 this year, AAA Auto and Bilia AB are the only companies in the group, apart from UK franchise operator Pendragon, to show three year gains, with Bilia up an astounding 187 percent over the period. "Retailers continue to be impacted by uncertain economic conditions, and this is unlikely to change for the foreseeable future,” said Jason Wakelam, leader of PwC UK's Automotive Transaction Services.